Sometimes I really feel the need to take a break from a project and make something else. Usually a small, quick to finish project for instant gratification. My 4 swap projects have turned out to be rather time consuming projects that I have never attempted before. Being first time projects means, of course, I am learning a lot of new techniques. I really would like to show them to you but have to wait for the last two to be finished. Nearly there. I am still waiting for one swap partner to notify me that she has received her package. Hopefully soon! Lavender sachets filled with my very own lavender picked fresh off the bush early spring. Drying time took longer than normal because we finally, after years of drought, got some rain! Yay! Our Murray River is starting to fill up again. A couple more that still need to be finished! Surprisingly I am not finding any suitable fabrics to compliment them in my scrap basket! Something will turn up I am sure. 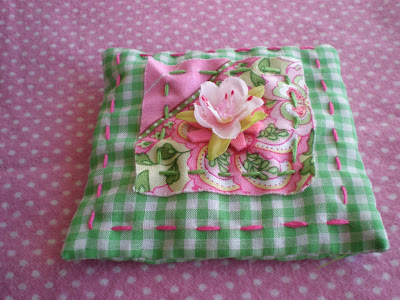 Free pattern and instructions can be found at Bustle and Sew. Or you can buy this book. The same pattern is in there. These are just too sweet! What a wonderful idea...and you are always so good about sharing the patterns and such. I love the little experiment you did as well. You're quite a crafty lady! Good idea to "try out" using your husband's clothes. Mine is rather vain so I would have to sacrifice my kid's clothes! These are really beautiful. Thank you for sharing. 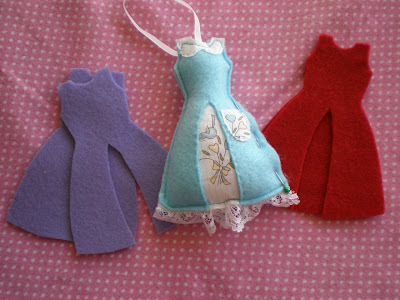 I have made some of those little dresses! And I love your dryer satchet. Great idea - better idea to try it out on hubby's clothes first! That's really cool. 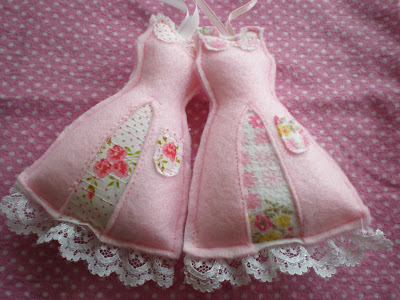 How special that the lavender was picked by you and I love the pink dress. Very pretty. Very cute sachets. I am wishing for lavender in my garden. Acabo de conocer tu blog y queria felicitarte por lo bonito que es y las cosas que haces. Me quedo acompañandote para no perderme ni un detalle.